Chop 17 eggs for the chicken salad. Combine chopped eggs, chicken, celery, pickle relish, pepper, dry mustard and mayonnaise. Mix lightly until well blended. 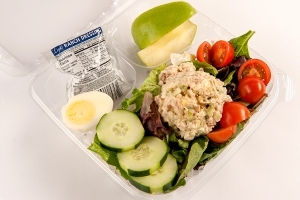 Portion ½ cup (#8 scoop) of chicken salad in center of mixed greens. Garnish with paprika. In top left corner, place ¼ cup of grapes or other fresh fruit. Place 1½ ounces packet of Fat Free Italian dressing in bottom right corner. Portion one chicken salad salad per serving. Each portion provides 2¾ oz. eq. meat/meat alternate, ¼ cup fruit, ½ cup dark green vegetable, ¼ cup red/orange vegetable and 5/8 cup other vegetable. Presentation Ideas: A container allowing space for the salad, fruit and dressing is recommended. Clear plastic lid for eye appeal is preferable. 1 serving of Chicken Salad Salad.